Planning a short break in Sorrento and want to know the best sights, beaches, and nearby day trips to fill three days? With this Sorrento itinerary, you'll see all the best of Sorrento, Italy and environs with time left over to relax. There is a vast choice of hotels, bed and breakfasts, and vacation villas and apartments in Sorrento, but for a short break we suggest choosing accommodations which are centrally located, ideally in the area between including the historic centre and Corso Italia. Any accommodation within a ten minute walk to Piazza Tasso (you can check this on Google Maps) is perfect. There are very few hotels in the centre of Sorrento which offer sea views, and these are obviously the most expensive. Most hotels with a sea view are located outside the centre of town, so are more suited to a longer stay. If you are arriving in afternoon (most likely, given travel times from the major airports and train stations), you'll have time to check in to your hotel and pop out for a look at the town of Sorrento. You can begin with the classic walk along Corso Italia and Via San Cesareo, stopping for an aperitif in Piazza Tasso. Afterwards, enjoy a leisurely dinner in one of the many restaurants in the historic centre, many of which feature local cuisine and seafood. 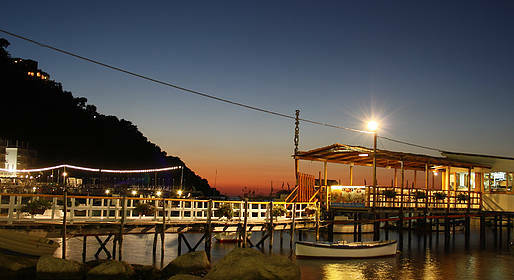 For dinner, we suggest choosing one of the waterfront restaurants in the fishing village of Marina Grande. A candlelit dinner on the Mediterranean with surrounded by the sleepy atmosphere of this historic port is unforgettable. Get to know Sorrento a bit better with this walking itinerary of the center Sorrento, with a stop at the Correale Museum and the Museum of Inlaid Wood. You can dedicate your afternoon to shopping (most shops are open in the afternoon every day during the week).